This is your chance for you to fulfil yourself, achieve your goals, develop yourself further and, in doing so, you can contribute to making the world a bit more worth living in for all people. Enter into the FRAMO eTruck world with quiet, clean, and safe powerhouses, the most innovative eTrucks of up to 44 tonnes for many industries. 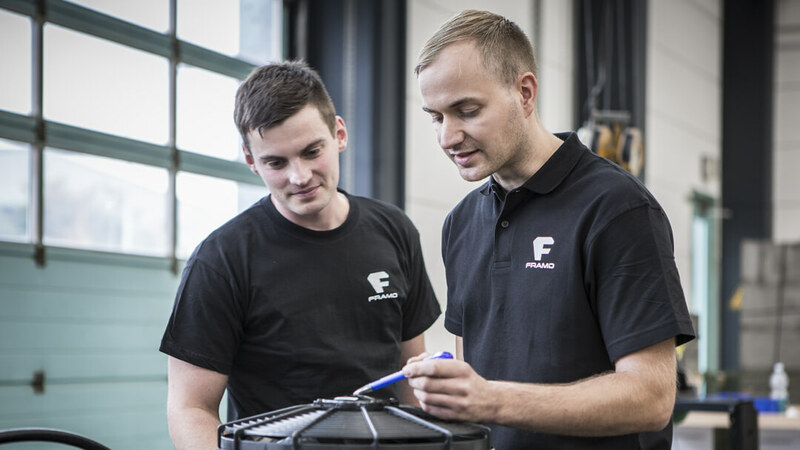 At FRAMO you can expect to be responsible for exciting tasks, as well as attractive benefits in one of the most active and most future-orientated companies in the HGV industry. Exciting start! Start at FRAMO straight after the end of your training or your degree. Think laterally! Work has to be fun, and it has to pay off! Here is your new challenge. Try out a career! Gain experience at an innovative company and prepare for your future. The production of our FRAMO eTrucks requires the most modern working environments with creative spaces for employees, standardisation as far as possible with maximum flexibility and employees together with whom we can create even more efficient production processes. FRAMO eTrucks are innovate products that are the results of research and development, and completed by the expertise of our employees. Every employee contributes daily to FRAMO eTrucks being right at the very front. FRAMO is one of the most efficient companies in the eTruck sector with unique selling points. Our optimised processes in business have the aim of making us no. 1 in Europe for eTrucks of up to 44 tonnes long-term, and one of the best employers.